QUESTION: So how about this "guarantee" you've got? ANSWER: We really do believe we offer the best guarantee in this business. Most companies don't even have one at all! If within the first week you have your product you don’t like it for any reason, send it back and we'll make it right or refund the money you spent on our product. QUESTION: After that time period is up, are there any warranties for your products? ANSWER: Each product does come with it's own warranty. Retractable Banner Stands have a two year warranty. If there is a mechanical failure on the stand, you can send it back for a replacement. Banners have a lifetime warranty. If your banner fails to be usable (significant fading or damage), we'll reprint the same banner once (no modifications or updates). Warranties do not cover what we would call "abuse", or damage due to mistreatment, neglect, or improper/bad hanging or installation methods/procedures. Ask us for other warranty information on our other products. QUESTION: What kind of turnaround time can I expect on my order? 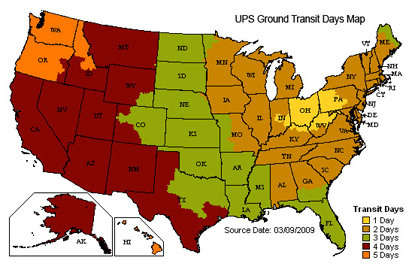 ANSWER: We generally ship UPS (and sometimes USPS to Canada). Expedited shipping options are available, including Next Day Air Early A.M. We charge actual UPS published rates based upon shipping destination & estimated weight plus a $2 handling fee. If you have a question about shipping transit time, please ask and we can check for you, or you may refer to the map on the right for estimated ground transit time. QUESTION: What about payment methods, what do you accept? ANSWER: Credit Cards: Mastercard, Visa, American Express, Discover - Your card info will be taken when you place the order and charged when you approve the proofs. Checks: Checks must be received and clear before order will be processed. Purchase Orders: We accept some institutional POs. QUESTION: What if I want to cancel my order and get a refund? ANSWER: We will gladly refund your purchase price if you cancel your order before approving the final proof for printing. Some design fees are non-refundable after work has been completed. Once the order has been approved for printing refunds will not be issued for cancellations. QUESTION: What can I expect in the way of discounts for larger orders? ANSWER: For non-rush order sub-totals of $1,000+ we offer a 5% discount. For non-rush order sub-totals of $2,500+ we offer a 10% discount. Discounts do not apply to design fees. Rush orders receive no discounts. QUESTION: So how do sizes work for banners and other prints? ANSWER: Everything we do is custom. Custom design and custom size. We basically charge per square foot, but you can let us know down to the inch what size you're looking for. Sometimes finished product sizes may vary by up to 1/2 an inch from the original order size because of the print and finishing process. If a certain measurement must be precisely met please notify us. QUESTION: What are your size limitations for prints? ANSWER: The majority of projects can be completed in any length and in widths up to 4’ - 4.25’ depending on material, finishing options, or application. Some materials can be and should be applied in panels (ie: window film). If your project requires a larger single piece product (up to billboard size, 20’ x 50’) we can print these but at a lower resolution and perhaps increased turnaround. Let us know about your project's specific needs. QUESTION: I hear a lot of places won't do exact "color matching", including you guys. What does that mean to me? ANSWER: This is true. Due to limitations and differences between individual computer monitors, calibration, drivers, software, soft proofing profiles, and our solvent print process, we can not guarantee that the printed products’ colors will be an exact match to the proofs you see on your screen. Computers, you can't live with them and you can't live without them! Most people won't even notice the difference, or if they do, won't care because of how minimal it actually is. However, some businesses require exact color matching. An example would be for a corporate logo. If you require specific color matching please contact us and let us know. We can ship out printed proofs or color swatch samples you can choose from if necessary. QUESTION: What kind of quality can I expect on these prints? ANSWER: Print out a big, bright, colorful photograph that is larger than a person and everyone says WOW! However, this IS wide format printing... so if you get your face 4 inches from the surface you're not going to see quite the same quality you would in a magazine or a wallet sized photograph. Look at it like this: stand a couple of feet back and you may think you're gazing out a window. In the wide format printing world, our quality is considered very good. QUESTION: What resolution (DPI) do you print at? QUESTION: Was that your shortest answer? QUESTION: So you guys do custom work huh? You'll print ANYTHING I WANT?!?!?! ANSWER: PROBABLY! However, we do reserve the right to refuse an order in case your content is rather... offensive. Some stuff we get sent is just too raunchy... ugg. QUESTION: How do we order?!? !